Game day food is an important subject at our house. My husband is a huge football fan and most weekends during the season there are multiple games that must be watched. As for me? I preoccupy myself with the food. That’s my favorite part of football season. The Super Bowl is just around the corner, yet this is also that time of the year when I’m still craving healthier foods after all the madness of the holidays. These eggplant spinach meatballs are the perfect compromise. Fun and football appropriate, yet packed with ingredients that won’t throw your goals for the new year off track. Don’t like football? Don’t worry! These meatballs also make a delicious dinner – served over spaghetti, zucchini noodles, or even with some crusty bread! These meatballs do have a few steps, but each is simple. First, you’ll roast some eggplant to get it nice and tender. The eggplant is then added to a food processor, where you’ll pulse it a few times to break it down and make it easier to form into balls later. In my food processor, this takes about 4 to 5 pulses — you want to pulse enough to chop it, but not go so far that it turns into a puree – so there is still some texture. The eggplant is then mixed together in a large bowl with a few more ingredients, like ricotta, spinach, ground walnuts, and bread crumbs. The mixture will be on the wet side, but you should be able to form it into balls. If it seems too wet, you can add in a little bit of flour at a time (about 1 tablespoon) to get it to a point where you can form it into the balls — but don’t add too much extra or the meatballs will be dry after baking! A cookie scoop really is your best friend here. It makes the process much easier and you’ll also wind up with meatballs that are all the same size. One final note — if your ricotta is liquidy, you may want to strain it before using. Excess moisture and liquid will make it difficult to form the mixture into the meatballs. Vegetarian meatballs made with roasted eggplant, walnuts, ricotta and spinach. Perfect for game day or dinner! Add the eggplant to a large rimmed baking sheet, then drizzle with the olive oil and sprinkle with the salt, red pepper and garlic. Toss to combine, then spread in an even layer. Bake for about 15 to 20 minutes, stirring once halfway through, until tender. Remove from the oven and set aside to cool slightly. Decrease the oven temperature to 350ºF. Meanwhile, add the walnuts to the bowl of a food processor and process until finely ground–but don’t go so far that it turns into a paste–then add them to a large bowl. Fold in the breadcrumbs, flour, shallot, parsley, oregano, basil, ricotta and spinach; set aside. Add the roasted eggplant to the bowl of the food processor. Pulse until the eggplant is chopped well, but there is still some texture. You don’t want to completely puree the mixture. Transfer the eggplant to the large bowl and mix until well-combined. Add additional salt and red pepper to taste, then stir in the egg. Form the mixture into balls about 1 1/2 inches in diameter. Place the meatballs on a parchment-lined baking sheet. Bake the meatballs for about 25 to 30 minutes, until firm and lightly browned. Serve with marinara sauce. I love meatballs! I bet these would be tasty! Thanks for sharing. These look great. Would you be able to use tofu rather than ricotta? Whilst I am not vegan, I try to stay dairy free most days and this looks like it would adapt quite well. I think it could possibly work really well here. I haven’t tried it myself though so I can’t be sure. Please let us know if you give it a try! Mmmm…I love eggplant, and I bet these meatballs taste absolutely delish! 🙂 Can’t wait to test it our for myself! Pinned! Mmmmh meatless meatballs? Too good to be true and I am beyond intrigued! YUM! I’ve got all the ingredients on hand. Can’t wait to try. A great low fat alternative for Game Day. Normally when I work with eggplant I let it sit (lightly salted) to get some of the moisture and bitterness out. This recipe doesn’t call for that. Do you think that it is still a good idea? Hi Tasha – we didn’t test it with salting the eggplant here, so it’s hard to say for sure. It could possibly slightly alter the moisture content of the mixture (before you form it into balls), but it’s hard to say if it would make a noticeable difference. This came up in my Bloglovin’ feed and I clicked in to find it was you, Ashley! I guess it figures? 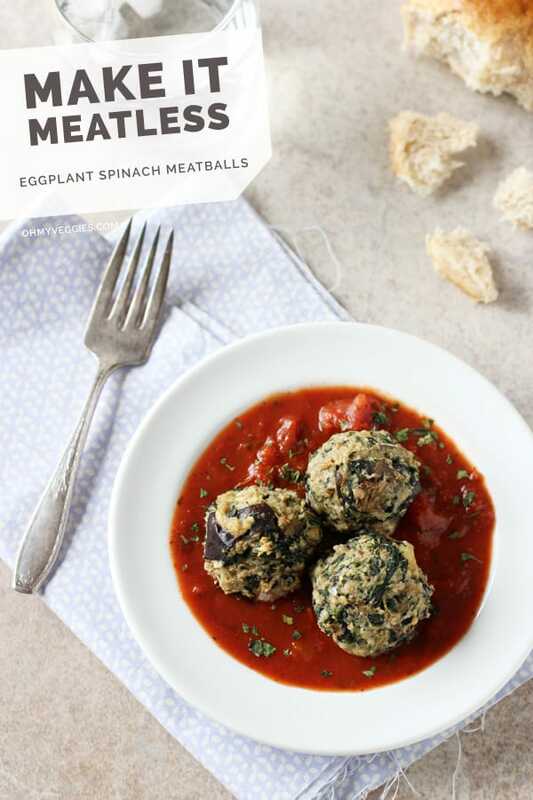 haha I love the sound of these meatless meatballs because I’m crazy about eggplant and spinach! Very creative, and love this veggie meal that’s perfect for Game Day! haha I love it! Thanks Marcie! Can you freeze these for later use? Hi Jay – I haven’t done it myself yet (we eat them too fast), but I think they would freeze okay. So happy to hear it! Thanks for sharing and letting us know! I can’t believe there’s no “meat” in these meat balls. You’ve done such a wonderful job seasoning these. Glad I popped over to Oh My Veggies today. Thanks Laura! They are definitely packed with lots of flavor! Love this recipe – sounds so good!! I’m allergic to nuts, however…do you have a suggestion for replacing the walnuts? Or could I just leave them out? Hey Amanda! Are you allergic to sunflower seeds? If not, you could definitely sub those in (although I would only use about 1/4 cup). Otherwise, I would just leave the nuts out and then add in a little extra breadcrumbs if the mixture is too wet for you to form into balls! I am loving the sound of these meatless, veggie packed balls! Loving the walnuts in them! Thanks Shashi! Me too – I can never get enough walnuts! Beautiful recipe, Ashley! I can’t wait to give these a try! I make eggplant balls CONSTANTLY as meatball substitutes! They are the best!! Love that these are greens-stuffed. They really are – I can’t get enough lately! Could I substitute the egg with a “flax egg”? Hey Mady! We haven’t tested this recipe with a flax egg but I imagine that would work okay here. I just made these. They are wonderful and easy. The only change I made was with the nuts. I used about 10 mushrooms that I processed In place of them. Thank you they are perfect! So happy to hear this Nancy! And good to know about the mushrooms! I am a huge fan of not only eggplant but going meatless as often as I possibly can. These look fantastic and I bet I wouldn’t even miss the meat! The walnuts add a nice crunch and protein! Cannot wait to make these crowd pleasers! Thanks Gail! I love eggplant too! Hope you enjoy! Thank you! I know I will! We have eggplant growing in the back yard too! However it is taking it’s sweet time getting bigger with all this heat we are having! So happy to have found your blog! Just simply amazing! I loved making these and eating these. Thank you for the amazing recipe. So happy to hear this Yvette! Thanks for letting us know! Any suggestions on what I can use to replace egg? What is a good binding ingredient alternative? I think a flax egg could work here, but we haven’t tested it ourselves so it’s hard to say for sure!